“Doth mother know you weareth her drapes?” More Shakespeare in the Park after the jump. Of the six figures in Walmart’s exclusive Marvel Legends-scale wave of Avengers, two figures are actually reused sculpts. This is one of them. In fact, from the neck down, this figure is exactly the same as the figure from the Thor movie 6 inch line last year. It’s not even really a repaint, the paint job and colors are exactly the same, with the only exception being that this new version lacks the dark wash on the arms. The packaging looks like the rest of the wave. Grip, tear, remove figure, discard packaging. That’s all you need to know. The only thing technically qualifying this figure as a re-tool and not a total re-pack is the head. Hasbro gave us the helmetless head originally shown at NY Toy Fair in 2011. The sculpt itself isn’t bad. I said in my review of last year’s figure that I liked the sculpt, and that still holds true. But it is a little disappointing that it was used for this release, since it’s not actually accurate to the costume Thor wore in The Avengers movie. 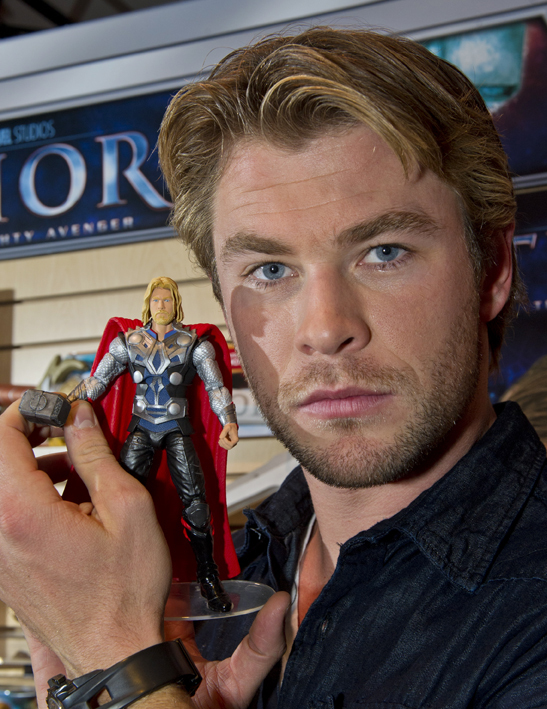 As such, we’re not getting an Avengers Thor so much as we’re getting a Thor movie Thor with an alternate head. It’s also a little confusing that we got this figure again, instead of the new version shown at NYCC last year. That version featured Thor in his “casual Friday” costume, with no cape or arm armor, and his vest open. 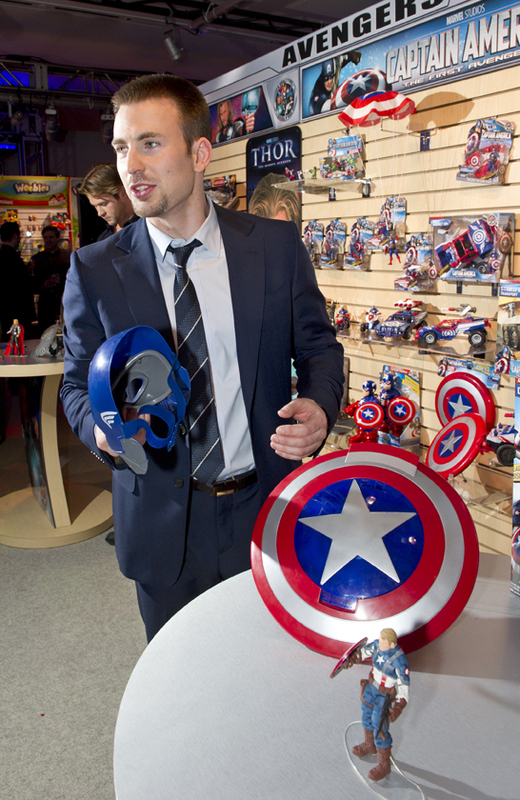 Like when he’s just chilling on the Helicarrier. So… where’s that figure? Maybe we might actually get a second wave of these? I really hope so, because if I don’t get at LEAST a Black Widow to finish off the team, I’m going to be seriously bummed. I’d also happily buy Maria Hill, Agent Coulson, Iron Man Mk VII, unmasked Cap (we know that head has already been sculpted), a new Nick Fury, as many Chitauri as they want to crank out, and pretty much anything else of this caliber. Your move, Hasbro. The new head looks good. It captures Chris Hemsworth’s likeness much better than the helmeted version. Again, the only real accessory included here is Mjolnir, but unlike the previous release, this one also comes with the connecty stand. I dig the connecty stands. If you’re on a budget and don’t want to buy all the figures in this series, this is one you can safely consider skipping, if you have the previous version. True, Thor didn’t wear his helmet at all in The Avengers, but he also didn’t wear this costume, so you’re already missing an Avengers-accurate Thor no matter what. If you don’t have that previous figure, or have the extra cash to drop, this figure is far from terrible. It’s just not as exciting as most of the wave since it’s 90% old territory.